For several months, I’ve been wondering out loud when the airlines would deploy big, bold frequent flyer promotions to stimulate sluggish travel. In January, when [% 2807001 | | Midwest %] rolled out a promotion offering up to 10,000 bonus miles for flights throughout their network, I suggested that we might be seeing the first of many such systemwide offers. I was wrong. And while double miles are on offer in the new promotion from US Airways, it falls well short of the widely applicable promotions I have been predicting. The latest promotion awards Dividend Miles members with double [[Elite Programs | elite-qualifying miles]] for flights on US Airways, US Airways Express, and US Airways Shuttle between February 3 and March 31. Only flights completed after registering—either online or by calling 800-428-4322—count toward earning the bonus. The key words here are “elite-qualifying.” While the bonus miles do count toward earning elite status—a good thing—they cannot be redeemed for an award—a significant limitation. As a result, the offer has real value only to those who travel often enough to come within striking distance of 25,000 flight miles during the calendar year. That’s what it takes to earn entry-level elite status. So if you’re among the select few who could realistically benefit from an elite-focused offer, either by earning elite status or upgrading to a higher elite tier, this promotion could be a good reason to fly US Airways before March 31. Otherwise, the offer is moot and shouldn’t be factored into your choice when airfare shopping. As for that big, bold promotion to stimulate travel? We’re still waiting. 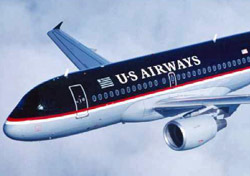 And you, fellow traveler: Will US Airways’ offer affect your travel planning? If not, what would? Please share your comments below.